The New York Fed hosted a one-day conference exploring progress and challenges in reforming culture and behavior in the financial services industry from a variety of perspectives. 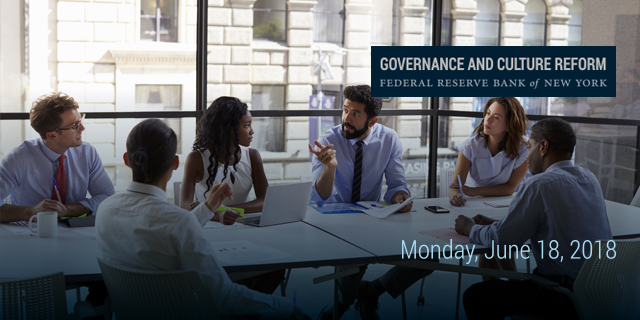 This event built upon previous New York Fed conferences in 2014, 2015, and 2016 on reforming culture and behavior in the financial services industry. The program focused on assessing progress to date; exploring ongoing and new challenges; and preparing the next generation of leaders to continue driving cultural reform. There is international consensus that culture is an important part of a firm’s sustained healthy performance. The industry and the official sector are increasingly collaborating across borders to promote higher standards for conduct and to address common cultural challenges. The reputations of firms are as interconnected as their operations. The industry must work together to address culture, as a problem at one firm affects its peers. Firms should avoid becoming complacent about banking culture and conduct as broader economic conditions improve. Organizations must assess and reform their incentive structures (including compensation, career advancement, and other forms of recognition) to align with values, business strategy, and customer interests. Senior leaders—boards and executives—can use a variety of methods to assess their cultures and subcultures. Supervisors and regulators can offer feedback on culture and conduct that combines independence with broad knowledge of industry practices. Boards in particular may find this input helpful. Supervisors in many jurisdictions are exploring how to incorporate cultural and conduct assessment into their work, although their approaches vary. Some assess culture under a prudential supervision mandate, others under a conduct mandate, and others through integration into more traditional concerns about safety and soundness, risk management, and financial stability. As the financial crisis fades from institutional memory, it will be increasingly important for firms to impart lessons learned from the brink to the next generation of cultural leaders. Firms can partner with universities to develop training programs that emphasize sound ethical judgment alongside technical proficiency. Please address any questions to NY.FRB.Culture.Events@ny.frb.org. Read Bill Dudley's insights on Medium. Read Alison Cottrell's insights on Medium. Read Stuart Mackintosh's insights on Medium. Read Elizabeth Arzadon's insights on Medium. Read Kevin Stiroh's insights on Medium. Read Will Bousquette and Scott DeRue's insights on Medium. Read Sir David Walker's insights on Medium.